Welcome to Millennium Hilton New York One UN Plaza a landmark hotel across from the United Nations Headquarters and just blocks from the Empire State Building Times Square Rockefeller Center and other Manhattan icons. Starting 28 floors up our newly renovated guest rooms are artfully appointed and offer plenty of space to work and relax. Enjoy thoughtful amenities such as complimentary WiFi for Honors members a 40-inch HDTV and mini-fridge plus views over the East River or Manhattan skyline. Suites feature a separate living area additional bathroom and two HDTVs. Visit the Skyline Club an executive*s retreat on the 30th floor that*s perfect for mingling with colleagues or simply unwinding while taking in gorgeous city views. Available for a daily fee the lounge features continental breakfast all-day refreshments or an after-work cocktail. We make it easy to stay energized at Millennium Hilton New York One UN Plaza. Work out with a range of cardio and strength-training equipment in the fitness center - open 24 hours and complimentary to hotel guests - or challenge a friend to a game on our tennis court. Treat your taste buds to our Ambassador Grill open all day. Designated a New York City Landmark in 2017 this restaurant serves globally inspired cuisine in a historic setting. Order cocktails in the Ambassador Lounge or visit Un Cafe in those on-the-go moments. Plan a board meeting conference or elegant wedding reception in your choice of versatile event spaces. 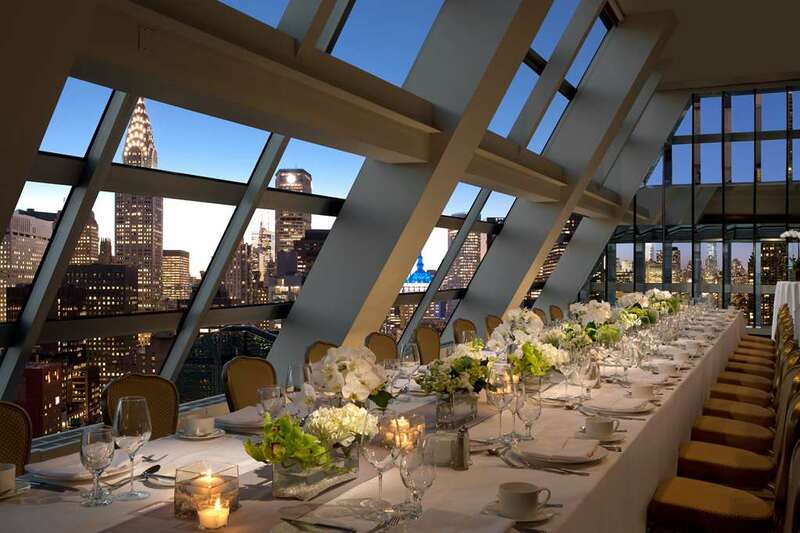 The Landmark Room is an especially stunning venue with floor-to-ceiling windows and sweeping views of the iconic city. The UN Cafe features snacks seasonal salads and artisanal sandwiches. Our baristas offer specialty coffees from illy to enjoy either in the lobby or on the go. Enjoy signature menu items from Ambassador Grill in the comfort of your room. Known for its distinct postmodern design Ambassador Grill is a New York City Landmark with globally inspired cuisine.